I don’t think Ethan and I, or Morgan and I, or Chandler and I, are going to fight much anymore. We are closer now even though we aren’t together. I feel it in my heart. I can feel them with me. I’m glad it’s me doing this instead of them. It breaks my heart to think of them having to go through this. I hope that none of my family members have to come here. I don’t care if it’s an adult or kid, nobody deserves to be here. It is the hardest thing ever. I hate this place so bad. It’s not fair. If I saw family members here I would feel sad and it would break my heart. I couldn’t stand it if Ethan had to go through this. He wouldn’t be able to handle it. I would hate to see Morgan have to go through it too. She wouldn’t be able to handle it either. Chandler would be able to handle it better than Morgan and Ethan, but wouldn’t handle it very well. I am able to handle it because I know more about what leukemia is. I know a little bit more of the routine here. 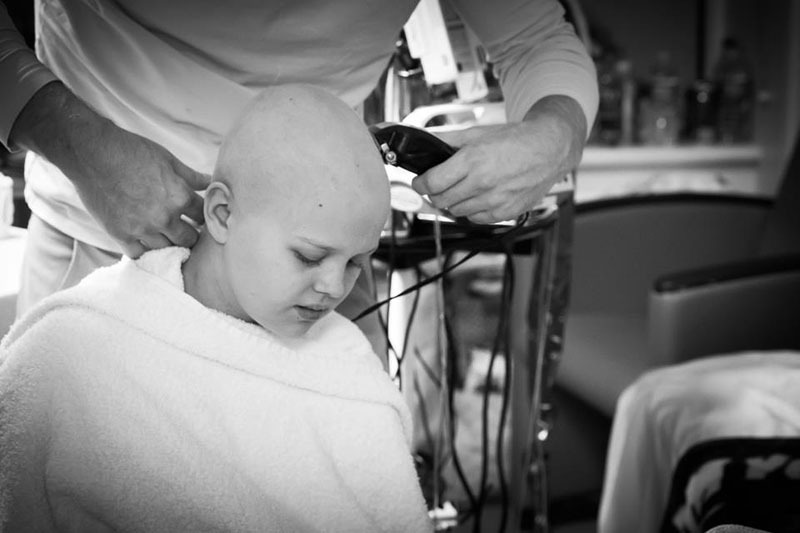 Before this, if you asked me if I could handle cancer, I would say “no.” I couldn’t imagine it. But now I know I am strong. I know that I’m worthy of feeling the Spirit and feeling God. He is the reason I can do this. I think after I am done with this disease, things wont be so scary anymore. Before this I couldn’t do shots. It would scare me to do doctor’s check ups. But now shots are nothing compared to this. A shot or a check up would be like the smallest thing compared to what I am going through here. It’s scary here. It is scary knowing you are in the hospital getting all this medicine and all the IV stuff. It is scary having doctors concerned about you and talking about scary stuff. They talk about a bunch of medicine. They talk about the worst things that can happen. The scale of things that can happen to me or my body is pretty big. There are a lot of bad things that can happen. I’m not talking death and stuff. Bad things like infections that I can’t fight off, or fevers, or being here a long time. The physical therapists tell me about what can happen if I don’t walk so it makes me want to walk everyday. It scares me to walk because I might fall. My muscles are so weak and aren’t working properly. It’s hard to walk even a couple of steps to the bathroom. I need to sit down a lot. I can’t really move my legs very well. When I walk in the halls with physical therapy I have to wear a mask that irritates my face that has a rash on it. I don’t like when nurses and doctors talk about NG tubes. It’s scary because if I don’t eat enough I will have to get one. I really want my white blood cells to go up so I can eat and drink. I really hope I get as big of an appetite as I can. It’s hard to have the energy to play games. Basically all day I watch TV, movies, and lay in bed. I am trying to do all I can so I can take as little medicine as possible. I don’t take pain medicine anymore for my mouth and throat. I don’t like being hooked up to stuff. After showers it feels good to not be hooked up to the IV pole with stuff going into me. Laying in bed is not that comfortable. I have to change sides a lot because it hurts my rash if I lay on one side for a long time. The hardest part about being here is being away from family and knowing that I am in a hospital. But what gets me through it the most is knowing that I will go home and that God will never leave my side. It’s scary looking at myself in the mirror without hair on my shoulders. Thinking about being outside and not having the wind blow my hair or having to pull my hair back kind of scares me. Sometimes it makes me feel ashamed that I have to be here. Shaving my head was one of the hardest things. It made me feel awful. Once there is hair on my head again, the disease is gone, and I don’t have to worry about cancer, I will be a better person, sister, and friend. If anyone goes through a hard trial, I sort of have more experience. Whether someone is in the hospital or just having a bad day, I know most feelings now. I know how it feels to suffer awful pain. I know how it is to be mad about yourself. I know how it is to be mad at God. I know what it’s like to look in the mirror and turn away in shame. I know what it feels like to be trapped, not able to go anywhere. I know what it feels like to be weak. I even know how it is to question if there is a God, if the church is true, and if the scriptures are true. I remember being so sick and yelling at God for not helping me. I’m kind of mad about being mad at Him because if He wasn’t here, and if I didn’t know about the gospel, I would… I just can’t imagine what it would be like. I know there is a God and only one true God. I love Him. He comforts me everyday. When I got chemo I couldn’t feel Him but I know He was and is there. I am so grateful that I know the gospel is true. I am grateful that I can be worthy to feel the Holy Ghost. Now I have 100% more faith in Him. I had a bad trial last year when my parents got divorced. I thought that would be the worst possible thing that would happen in my life. I thought I had so much faith and now compared to then, I have more faith than I have ever had. I feel Him with me. When I can’t feel Him, I hate it. I just have to know that He is there, He loves me, and I will be OK if I have faith in Him. How is this trial going to change me? I think I will feel better about myself. I’m going to be stronger. I will be able to help people with trials and I will be able to give them advice. I will be a better missionary. I will have more faith and more love in my heart. I will have a stronger testimony in the gospel and in Jesus. I’m glad that someone knows exactly what I am going through. Every pain and sorrow that I feel, Jesus Christ has felt it. I am glad that I have someone to talk to because He understands everything. What was I like before this trial? I hated my hair. I hated how it was thick and I had to straighten it everyday. I should have been more grateful to even have hair. Before this experience I felt like I was a wimp. I couldn’t do sports very well. I couldn’t get shots without freaking out. I couldn’t stand the thought of needles. I worried about the smallest things that really don’t matter anymore. I didn’t have faith in myself. I didn’t think I could do what everyone else did. I thought I was bad at everything. I thought I stunk at running. I didn’t run the fastest, even though I wasn’t the worst. I didn’t have faith when we were doing PE. I didn’t think I could kick the ball far in kickball. In my brain I would say “no” before I even tried anything. I didn’t think I could talk to boys or new people. I didn’t have much faith before tests and thought I would fail. I thought I was ugly. I thought I didn’t have cute clothes or cute shoes. But now that I think about it, I had more confidence than I realized. Looking back, I did talk to boys. I remember conversations I had with them. I remember talking to new people and even made a really good friend that was new this year. I didn’t realize how many friends I had or how many people cared about me. I always thought someone was making fun of me behind my back or talking about me. I thought I was hated. Now I realize I was worrying about stupid things that really don’t matter. Once you are in the hospital and going through this, you realize what you had that you never recognized. I think I never had confidence. I never believed in myself the way I should have. I didn’t think I could do anything right. I didn’t have faith in myself. After this I think I will have a completely different point of view in life. I won’t care so much about how I look or how my hair will be. I won’t try to impress people by being someone I’m not. I will still care about friends and who I come in contact with. I will have more faith in myself and know that I can do anything. At school I will know that a lot of people care. In PE I will probably be able to do anything that everyone else is doing. I won’t say “no” before I try. I won’t be so insecure. If I do something wrong, it won’t be as big of a deal. I will just know that I am beautiful. I will know that I am strong. I won’t doubt God again. I will be able to trust Him more. And I’ll probably not want as much junk food as I did before because now it all sounds gross. Ha Ha. My mom told me today that when I was really sick (I can’t remember being so sick), I told her that my great grandma Holt, who passed away in November, visited me a couple times. In the post my mom wrote that I said “my great Grandma told me that everything is going to be okay. She told me to have faith. She told me to focus on today, hope for a better tomorrow, and know that God has my back. She told me that I am strong. She told me not to listen to what people are saying in my room because no one knows what my body can do like I do.” Thinking that my great Grandma said those things gives me a little bit more determination to go home. It is kind of like a boost to my spirit. I believe angels are here guarding me and protecting me. I can feel it. I know dead family members have been with me. They have protected me and helped me get through another day. I know everyone’s fasts and prayers have helped me. I probably sometimes don’t know how the prayers have helped me but I know somehow they have. My rash hasn’t really improved yet but it hasn’t gotten worse. I still can’t eat or drink much. My legs feel weak. My arms are itchy. I know everyone prays for me and fasted for me Sunday. I know the fast will help me soon. I haven’t lost my faith by me not getting better right away. I know eventually I will get better in God’s time. Thank you for your support and for the fasting and prayers for me. I know each person is helping me. Each prayer has helped me be able to be stronger. Ashtyn and I are spending our 25th night in the hospital. She is no longer being kept awake by nausea, vomiting, coughing, mucous, diarrhea, bloody noses, restroom runs every two hours, shortness of breath with fluid in her lungs, or an extremely swollen mouth. She isn’t suffering from a high temperature, high heart rate, or high respiratory rate. For this we are grateful. For this my heart rejoices. Tonight Ashtyn was being kept awake because of sadness. Sorrow that she can’t go home. Sad for losing her hair. Worn out from the pain. I don’t know what it feels like. I don’t know what it feels like to not be able to leave the hospital. I don’t know what it feels like to lose my hair. I don’t know what it feels like to not be able to eat or drink. I don’t know what it feels like to not be able to get out of bed and walk around on my own. I don’t know what it feels like to be stuck to an IV pole with medications constantly going into my system. I don’t know what it feels like to not be able to shower and go to the restroom in privacy. I don’t know what it feels like to have strangers coming into my room all the time asking, “How are you?” when clearly I am not OK. I don’t know what it feels like to have visitors come, only to have them leave and know that I can’t leave with them. I don’t know what it feels like to have constant pain in my mouth and throat, even though I should be happy they are healing. I don’t know what it feels like to have leg pain and not feel like rejoicing that it’s a sign the bone marrow is starting to make cells. I don’t know what it feels like to not want to think about life outside the hospital and what I am missing out on. I don’t know what it feels like to not allow myself to think of what used to make me happy because those things would only make me sad. I don’t know what it feels like to have no control over anything other than what side of my body I sleep on, what finger the oxygen monitor goes on, and what TV station or music is playing. Tonight Ashtyn finally fell asleep at 4:30 am listening to Pandora’s LDS Hymns and looking at a picture of Christ loving children. When I see the physical and emotional pain Ashtyn is going through, I feel sad and have shed tears with and for her. However, if I had the ability to take this cancer away from her, I wouldn’t. You heard me right. I would not take this cancer from her. Why would I rob her of this life changing experience? Ashtyn chose this before coming to earth. She knew the pain she would experience. She also knew the blessings that would be hers from going through it. Lives would be changed. Her life would be changed. Every moment of her trial will be worth it. She will never want to give back what she gains and what she learns. It will be precious to her. So as a mother, why would I ever take that away from her? I am happy for her that she is the kind of girl that God has trusted to go through this with faith, strength, and dignity. God has every confidence in her that she will get through this trial. I do too. Why is it that most Sunday mornings I have the same thought come to mind? “I am so tired. I don’t want to go to church today.” But every Sunday I push through that thought, hop out of bed, get my dress on, and head to church. Whether the three hours at church is remarkable or uneventful, when I get home I never regret having gone. This Sunday was no exception. Throughout the morning I kept waking up every hour or so, would look at my clock, and feel too tired to wake up. By 10:15 am the thought came to me as it always does on Sundays, “I’m too tired for church.” That thought came to me even in the hospital? When church is only 30 minutes rather than 3 hours? Where I can wear whatever I want and I don’t have any kids to get ready? And all I have to do is walk 1 minute directly downstairs to the assembly room? Pitiful!!! But just like all the other Sundays for the past 19 years of my adult life, I got up to go to church. I quickly put a pair of jeans on and a shirt, (I’ve never worn pants to church before however in the hospital any attire goes), brushed my teeth and hair, ordered Ashtyn some Top Ramen for breakfast, and by 10:30 a.m. I raced out of the room telling Ashtyn I would be back in 30 minutes. I walked downstairs into the assembly room where church was being held. There were close to 100 other people attending. We sang an opening hymn, a prayer was given, and we were welcomed to the service. We then sung the sacrament hymn and took the sacrament. When the sacrament was completed the church leader who is in charge of the hospital L.D.S meeting announced the special musical number. It was a song sung by Vocal Point, the Brigham Young University’s 9-man a capella ensemble. As I sat and listened to the most powerful rendition of “I need thee every hour” the thought kept repeating in my mind, “Ashtyn has got to hear this.” After the musical number, a 10 minute talk, closing song, and prayer, the church meeting was over. I walked a few steps to where the a capella group was sitting and with tears in my eyes I asked, “Would you come to my daughter’s room and sing that song?” They answered, “We would love to.” I told them that I really wanted them all to be there so Ashtyn could get the entire effect of the song but didn’t know if the nurses would allow it. There is a fairly strict policy that only 2 people can be at the bedside. I tend to stretch the rule at times by having 3 people at the bedside, however I knew 10+ people would be pushing it. The church leaders wife, Cheri, listened as I told of my desire for them to sing to Ashtyn. When I was 12 years old I lived in Cheri’s neighborhood and went to the same church as she did. Cheri suggested that the group go to Ashtyn’s room right away and she would go up with them. I headed to Ashtyn’s room to ask her nurse permission. Soon the group of nine, and some of their wives stood outside Ashtyn’s door. Hardly able to maintain composure, I told them a little about Ashtyn. “A few weeks ago Ashtyn was what seemed to be an extremely healthy, normal 12 year old girl. She never had to go to the doctor’s for anything. A week ago she was diagnosed with a very rare type of leukemia. I believe God is giving her this week to build emotional and spiritual strength by giving her experiences like this. She is being prepared and fortified so that she will have the faith, courage, hope, trust, confidence, and determination to fight with everything she’s got.” I shared a few more of my thoughts pertaining to Ashtyn’s future. I then opened her door and invited them to go in. They greeted her with such love and then sung this song to her. Can you imagine the spirit that filled the room? They sung with such emotion and such power. I then asked Ashtyn if she had a favorite primary song she wanted them to sing. Immediately she said, “Yes. A Child’s Prayer.” So they sung her favorite song. 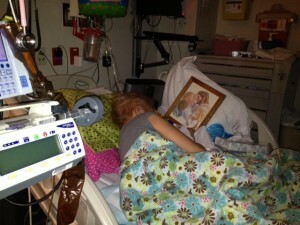 There are no words that can explain the spirit those men brought to Ashtyn’s room. There is no way I can explain the power that was there. I believe Vocal Point came to the hospital today for Ashtyn. They might have lifted other children and families as well, but they were sent for Ashtyn. I am so grateful I pushed through the thought of “I’m too tired to go to church” and went. It was a blessing that I knew Cheri and that she encouraged them to go to Ashtyn’s room at the time they did. I’m grateful that no medical staff stopped 12+ people as they walked through the locked doors and past several nurse’s stations to Ashtyn’s room. I feel watched over that Ashtyn had a nurse who was compassionate enough to recognize the benefits outweighed the risk of having so many at her bedside. Later in the evening Ashtyn answered her Uncle Ryan’s question, “Would you rather have had Justine Bieber or Vocal Point sing for you?” She said, “Well it’s Sunday so I’d rather have Vocal Point.” Me too. Our worldly enjoyments seem to be lessening in their significance as the heavenly enjoyments move to the forefront. The moment Vocal Point left the room, Ashtyn asked if she could see her siblings for the first time since being in the hospital. Tears filled her eyes as she longed to see them. To hug them. To have them near. The medical staff did not feel comfortable with letting her see them today. Tomorrow will be another day for another miracle. My hope and prayer is that Chandler, Morgan, and Ethan can see Ashtyn before she loses her hair and doesn’t feel well. I pray that Ashtyn will be able to see them while she is feeling well enough to enjoy it. This boost would be a great help to her and her siblings as they continue to prepare for the side effects from chemo that are in Ashtyn’s near future. Thank you for reading Ashtyn’s blog. Thank you for encouraging and supporting her. Thank you so very much for your prayers. I have seen your prayers being answered. When she is in need of a specific prayer, I feel in my heart to include Ashtyn’s Army. I don’t believe they will be answered any other way. Each prayer matters. Each prayer makes a difference. Each prayer brings power. Ashtyn ate 2180 calories today without a problem. That is a miracle. That is the power of prayer.